Given the state of my kitchen floor nobody should be surprised to learn that the carcass of last year's pumpkin is still lying in my backyard next to the compost bin. That's right, next to the compost bin. Not in the compost bin, where it might have eventually turned to compost. And by eventually, I mean within the next five years or so. I'm not the most responsible composter (periodically, I'll throw in fruit or vegetable scraps -- maybe a few dead leaves from the giant leaf pile also located next to the compost bin-- but it never gets turned or watered.) I know, someone who can't be trusted with regular kitchen floor maintainence should probably not attempt backyard conservancy. Where was I? Ah. Last year's pumpkin, rotting away next to the compost bin - a sickly shade of bone. You'll notice a giant hole in the right side of the pumpkin corpse - that would be where Brad kicked a hole in it when he discovered the pumpkin had become a favorite breeding ground for mosquitoes. But before becoming a bloodsucker love shack, last year's pumpkin gave us a gift. And that gift, of course, is more pumpkins. 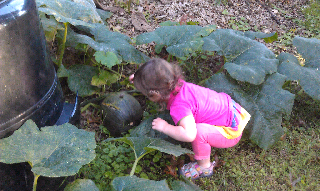 Lily investigates the progeny of last year's pumpkin. We started noticing a trailing vine growing near the compost pile a couple months ago, and as has been the case with yard work in the summer of baby No. 2, we ignored it. For once our neglect has paid off! We now have three dark green pumpkins and a slew of gigantic gourd-geous leaves (hehehe. sorry. it could not be helped). Well, technically we only have one pumpkin. The other two pumpkins are growing in my neighbor's yard. 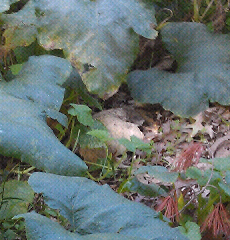 They, too tend to neglect their yard, so I'm hoping they haven't discovered our free range gourds yet. Anyway, I feel like last year's pumpkin is trying to speak to me from the grave. It seems like I should be divining a life lesson (or at least a writing lesson) from the new life that has sprung forth (and I'm not talking about just a rehash of that whole circle of life crap). The pumpkin has something more in mind. And every time I go out to check on the status of my new pumpkins, I try to listen to the dead pumpkin. So far, the only thing I hear is the buzzing of mosquitoes, the subsequent smacking of my hand on my leg, and my own grown of disgust as I wipe smashed mosquito bits on the grass. Maybe some character down the road will figure out what I'm supposed to have learned from last year's pumpkin. In the meantime, I know exactly where this year's pumpkins will end up in November.